Bannockburn is a rural township 20 km north-west of Geelong on the railway line to Ballarat. Bannockburn is on the east side of Bruces Creek, named after an early settler, James Bruce. It appears that his name influenced the choice of Bannockburn as the name of the township on Bruce’s Creek, probably commemorating the Battle of Bannockburn, Scotland (1314) when Robert Bruce defeated England’s Edward II. 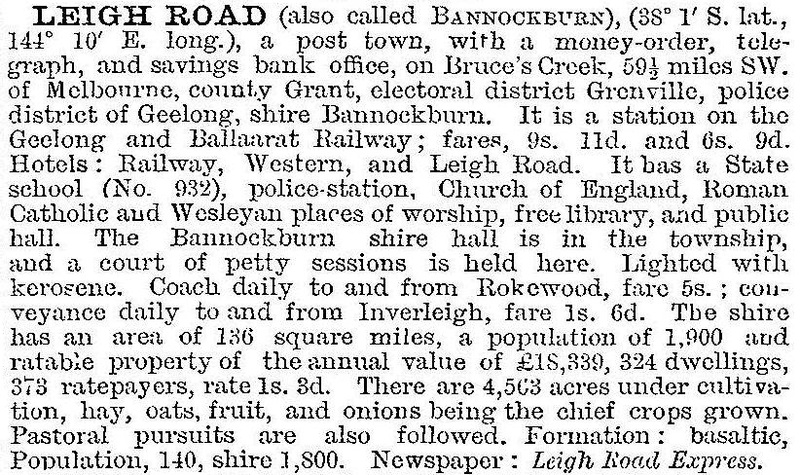 A Bannockburn Road District was created in 1862, the forerunner of Bannockburn Shire (1864). The opening of the railway line from Geelong to Ballarat in 1862 through Bannockburn ultimately ensured the formation of a district township. For some time, however, the earlier westerly route, the Leigh Road (Hamilton Highway), was a strong source of population movement and settlement, even to the extent of bestowing ‘Leigh Road’ as the name of Bannockburn’s railway station. Between World War I and World War II sports clubs, an angling club and lodges were established in what continued as a rural township. By the 1970s several of the early unused subdivision blocks were being built on and there were numerous rural/residential settlers. The land was relatively cheap, possibly because it had a lower rainfall than the Bellarine Peninsula which was attracting similar settlement. Bannockburn’s census population grew nearly threefold between 1966 and 1991. It has a shopping centre with a comprehensive range of retailing activities. The school had 245 pupils in 1998, 450 in 2010 and 524 in 2014. Bannockburn also has a golf course, a reserve, tennis courts, a bowling club, Anglican, Catholic and Presbyterian churches and a hall. There are also the original shire offices, the later enlarged offices (1981) and the Golden Plains Shire offices. The lockup and the railway station (now a bed and breakfast establishment) are on the Register of the National Estate. Bannockburn Vineyard was established in 1973. Despite some industries closing including the Bartter Steggles egg farm in 2008 with the loss of about 30 jobs, the decision in 2013 to connect the town to natural gas led to community confidence and lobbying for a new high school to be built.